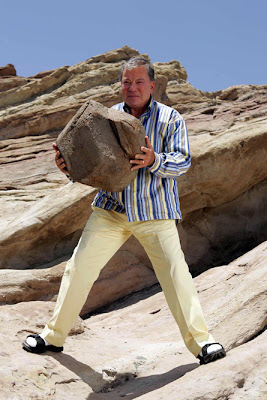 Jeffs Gameblog: Shatnerday will crush you! Trivia: Today marks one year of Gameblog observance of Shatnerday. You know, the Gorn cannon is going to be featured on Mythbusters. It's been a year already? My God. Wow, he IS brave for heaving that thing in sandals. Dude, spell it right or Shatner will crush you! He looks like he's carrying a 12-sided die from the Stone Age.